Enjoy a day on the water with Captain Steve Wilson on his 26-foot, custom-built center-console boat Dream Girl. Captain Steve is a U.S. Coast Guard Master and has been operating fishing charters in Ocracoke for more than 20 years. 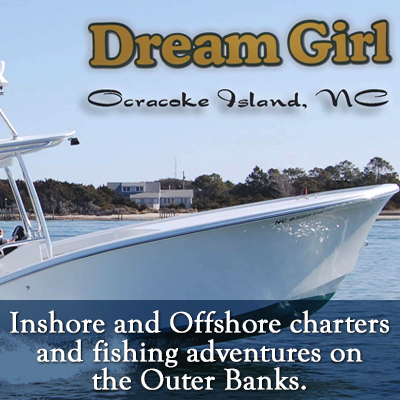 Whether you are a beginner, advanced fisherman or just looking for a fun family adventure, there is something for everyone on board the Dream Girl. Enjoy catching cobia, red drum, Spanish mackerel, blues, sea bass and many more. All bait, tackle and fish cleaning are included. You’ll find Captain Steve and the Dream Girl at the Anchorage Marina. There is something for everyone on board the custom-built Dream Girl. Call to book your fishing charter. No matter if you are an advanced fisherman, a beginner or just looking for an adventure for the family, we have somthing to offer!